Mark Walton, the junior running back out of Miami, started to gain some buzz in the dynasty community after rushing for more than 1,000 yards and 14 TD in 2016 as a sophomore. 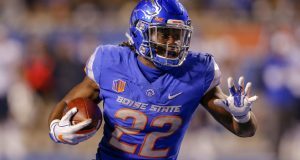 However, after being limited to just 5 games and 56 rush attempts in 2017 due to an ankle injury, Walton enters the NFL with several question marks. 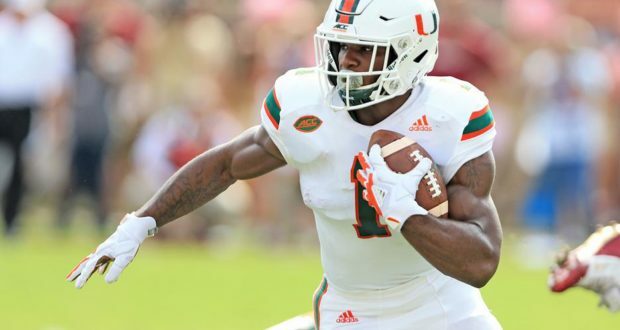 Before we get into the specifics of the injury and what it means for his long-term dynasty value, let’s dive into Mark Walton as a prospect. Walton’s best attribute is his pass catching ability, and as a result, he should be relevant early in his career in PPR leagues. In fact, during his days in Miami, Walton averaged 11.1 yards per reception, proving that he is not just a check down guy. He’s a playmaker who can be electric in open space after the catch. While Walton excels in the passing game, he is not the best interior runner. When I watch Walton on tape, he attempts to bounce the ball outside and hit the home run a bit too often. He does posse ss the ability to utilize cutback lanes with an excellent jump cut move, but to be effective at the next level, he will need to improve his ability to carry the rock in between the tackles. After showing promise during his sophomore year, Walton was injured in Miami’s fourth game of the season against Florida State in early October. This injury to his right ankle ended his season, and subsequently, his college career. Walton originally injured his left ankle a few weeks prior against Toledo, but he didn’t miss any time. 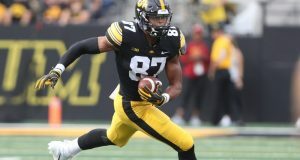 When he suffered a second injury to his right ankle against Florida State, he wasn’t so fortunate the second time around, as his injury required season-ending surgery. The opposing defender rolled on top of Walton’s right ankle as he was tacked, causing his ankle to externally rotate. This mechanism of injury is classic for a high ankle sprain, which is often accompanied by a fractured fibula. This diagnosis, though not confirmed due to a lack of available details, would make sense and fit Walton’s recovery timeline. In general, it takes athletes anywhere from 9-12 months before they truly feel 100%. Athletes are often medically cleared to play before they actually feel like themselves, moving symptom-free as a result, Walton’s performance at the combine may not be a true reflection of his ability. He posted just a 4.6 40-yard dash and 31.5” vertical jump. This poor performance could be a result of a lack of explosiveness and quickness that is so tough to get back after a major injury. Long-term, Walton shouldn’t be limited by his right ankle injury. If I’m correct in my diagnosis (which again, is not confirmed), then I won’t be concerned about recurring ankle injuries, and I do expect him to make a full recovery. Right now, Walton’s rookie ADP according to DLF’s March data is the 2.09. If an NFL team shows confidence in Walton’s health during the NFL Draft at the end of April, his ADP could climb. Expect to grab Walton in the mid to late 2nd round of your rookie drafts.